Saturday, I attended this lecture on the West Bank. I sat through this lecture with nothing but sadness in my mind and heart. All the attendees accept for one were European’s. The only Arab there was with his European lady friend. 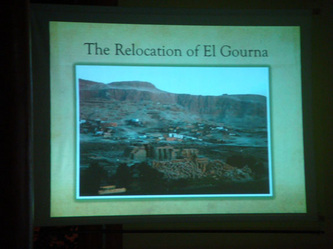 A Planning expert who had worked in Cairo for the government gave the lecture. Well, he is never going to put down his own profession! 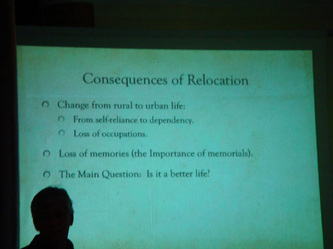 From the slides that were projected onto screen, only a few, and obviously the better off, were shown to be happy with their move and new homes. You only had to look at their homes to understand why they were happy; they were not the normal homes that the majority had to move into. I have spoken to and visited these peoples, I have seen their houses, been inside. Firstly they are sad and angry because there were no provisions made for their livestock, this is after all, there livelihood. They rear chickens, goats, sheep, and pigeons and so on to sell. They have buffalo and cows for their milk and land to grow there produce. The houses are a disgrace. No land around them. Some being only five years old, and they are in such a bad state of repair. The ones that I visited have large cracks running down the walls and along the ceilings. One house had a crack down the wall of one house, along the road and up the wall of the house on the other side of the street. They were built on unsure ground and now they are falling apart. The rooms are small and the kitchens are smaller than a broom cupboard. These people once earned a living from the tourists who visited the Qurna tombs. Now they have been displaced, families split up, no income. I have seen in one housing group a new souk built, but it lays empty because the unit rents are too high. How does this change the thinking of these peoples, their outlook on Egyptian life and feelings towards the tourists? They had to be removed, but with human consideration.